PROGRESS AT SEANOR FARM PARK. The Salem Twp. Supervisors, Recreation Board and the Salem Twp. Park Initiative Committee are pleased that the following work has been completed with the matching grant from DCNR. l. The road work and storm drainage. 2. Parking area including a paved handicap area. 4. Re-seeding of disturbed areas and tree planting. 5. The all purpose field including bleachers, storage shed, soccer goals, fencing and gates. The Field will be available for use in the spring 2018. 1. Sunoco Logistics has made a generous donation for a pavilion that has been erected. The concrete floor and kitchen will be completed in the spring. 4. Plans are to build the Restrooms in the spring of 2019. 6. Plans are to build additional walkways and roadways. 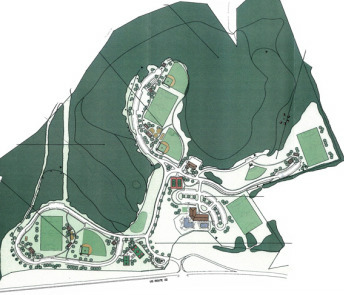 We have recently received notice from DCNR that we have been approved for a grant for construction of a playground which we hope to complete during this spring and summer. Plans are to construct a Volleyball Court and Horseshoe Pit in the future. We continue to seek other sources of revenue for these projects. With these additions, the entire Phase 1 area will be complete and provide the community with a nice recreation area. If you would like to participate in the park's development or just learn more about the project, consider attending a park meeting. The Salem Township Recreation Initiative Committee meetings are held at the Salem Township Municipal building on the third Tuesday of the month starting at 7:00 p.m. The Committee and the Recreation Board sponsor fund-raising activities to help support the project. Additional help is always welcome. Please consider joining us as we strive to provide a facility that will provide access for all. Tax free financial contributions are always welcome. Please call 724-468-4801 if you have questions.